I'm not exactly sure when we came up with this recipe... I know it was when I was living in Dallas and Andy was in DC because I knew he liked it when he emailed me asking for the recipe. Success! Wash the potatoes and cut them into bite size pieces. I like mine in bigger chunks rather than smaller pieces but to each his own. Also, I don't peel the potatoes, I leave the skin on. Put the cut potatoes into enough salted, room temperature water to cover. Turn the pot on and boil the potatoes until they are just fork tender-- don't over cook. Drain. While the potatoes are cooking, slice the red onion into very thin slices. Next, make the vinaigrette. Wash and roughly chop the dill. In a jar or container with a water-tight lid, combine the olive oil, red wine vinegar, red onion, salt, pepper and dill. I do 1 part Red Wine Vinegar to 2 parts Olive Oil (i.e. 1/2 cup Red Wine Vinegar to 1 cup Olive Oil). Use as much dill as you want, but since it's the primary flavor, make sure you use enough! Shake until combined. Taste the vinaigrette to make sure the seasoning is right. Pour the vinaigrette over the warm potatoes and toss to coat. Refrigerate overnight and test the seasoning the next day. Adjust accordingly. 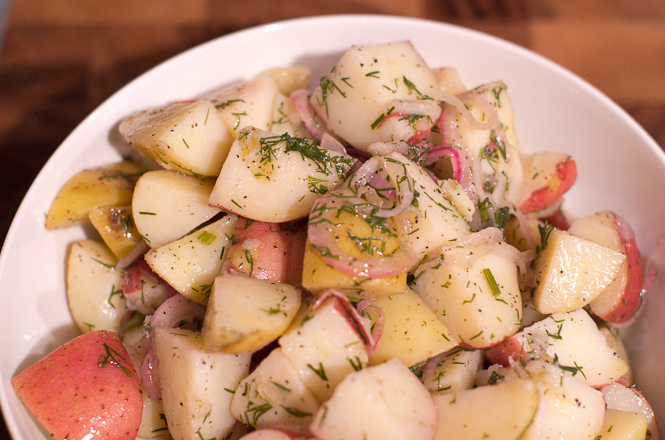 Leftover Tip: the potato salad is delicious roasted in the oven or in a skillet and served as a warm side dish!